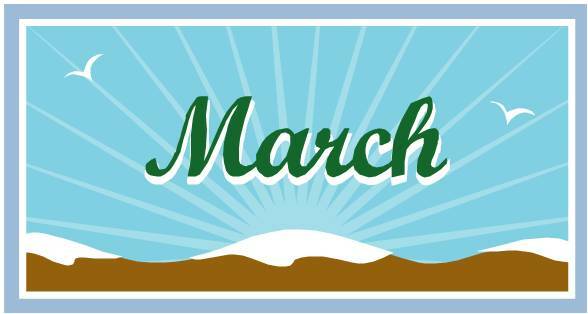 This year, March has presented plenty of excuses for having fun in the kitchen and cooking up a few extra carbs (I mean, treats). From Pi Day on 3.14 to St. Patrick’s Day to next Sunday’s Easter Day, I’ve been having a bit more fun in the kitchen than usual. I love pie. Given the choice of homemade cake or homemade pie, I’ll choose pie every time (unless coconut is involved). Pi Day is a great excuse to bake a pie or two or three. I had never heard of Pi Day until our oldest was in 3rd grade math. Then, one March evening at dinner, our daughter mentioned that the next day was Pi Day. Huh? “It’s March 14, Mom,” with an 8-year-old girl’s early attempt at eye rolling. “You know, 3.14.” Since then, I have tried to commemorate this celebration of math with pie. Even if you don’t consider quiche to be a pie, you can probably agree that it still qualifies as a celebration of Pi Day since it is baked in a circular container and can be measured using π. Those of you have been on South Beach Diet will recognize the mini frittata concept. I planned these for lunch rather than breakfast because they are easily made ahead of time and can be packed for lunch easier than brown-bagging a piece of quiche. The leftovers are great for breakfast on 3/15. I have to admit that I’ve never made chicken pot pie. My mom used to make them every once in a while. Unfortunately, my children have only experience the frozen food version. Like I often do, though, I was putting too much pressure on myself to live up to some Ideal that I conjured up in my head. So, the above menu did not actually end up taking place. (Real life just gets in the way, don’t you know.) However, I did cook the Dinner Menu. And it was definitely good! 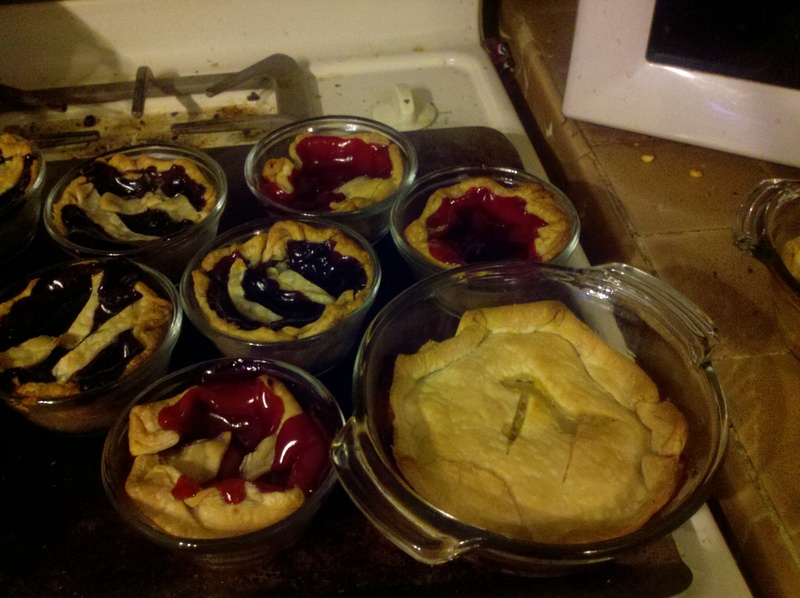 I made 5 individual pot pies and 8 mini pies, 4 blueberry and 4 cherry. Yes, I did cheat with the crust and used Pillsbury refrigerated pie dough that simply unrolls for both the pot pie and the fruit pies. In fact, the pot pie was a definite cheat all around–but the recipe was created, assembled, and baked by me, tasted homemade, and was a big hit with the family. My lattice didn’t come out very nicely for the individual pies–but they were gobbled up, nonetheless. 2. Preheat oven for 425° F.
3. Skin and bone your warm rotisserie chicken. Cut into bite sized pieces, about 2 cups, an place in mixing bowl. 4. Add in the frozen peas and carrots. 5. Add 1 cup of chicken or turkey gravy and stir. 6. Add thyme and pepper. Stir. 7. Adjust thickness with gravy. Remaining gravy can be heated and served at the table. 8. Set mixing bowl aside and open pie dough. 9. Unroll pie dough. Using one of your cooking vessels, cut circle around top of bowl, about 1/2-inch larger than bowl. Turn back over and arrange pie dough to line inside of bowl. My dough only went up the bowl about three-quarters of the way, which was fine. No one would have been able to eat a full bowl of this. 10. Repeat for other 4 bowls. 11. Fill each pie with the meat filling. 12. Cut tops for each pie out of dough. Place over the filling; crimp edges bottom and top crusts together. Cut slits for steam (I cut mine as a π sign for Pi Day). 13. Place in oven and bake for 20-25 minutes. Check. Crusts should be golden brown and filling bubbly when done. 14. Let cool for about 10 min., then serve with warm gravy and pepper on the table. In 2015, Pi Day falls on a Saturday and will be the once-in-century 3.14.15 day–that’s the perfect opportunity for my ambitious menu! Beef, onions & Guinness make this warm stew perfect for St. Pat’s Day. Serve with Guinness Quick Bread on the side. March has been roaring through Chicago like a lion all month, with no sign of the lamb at all. St. Patrick’s Day wasn’t an exception. 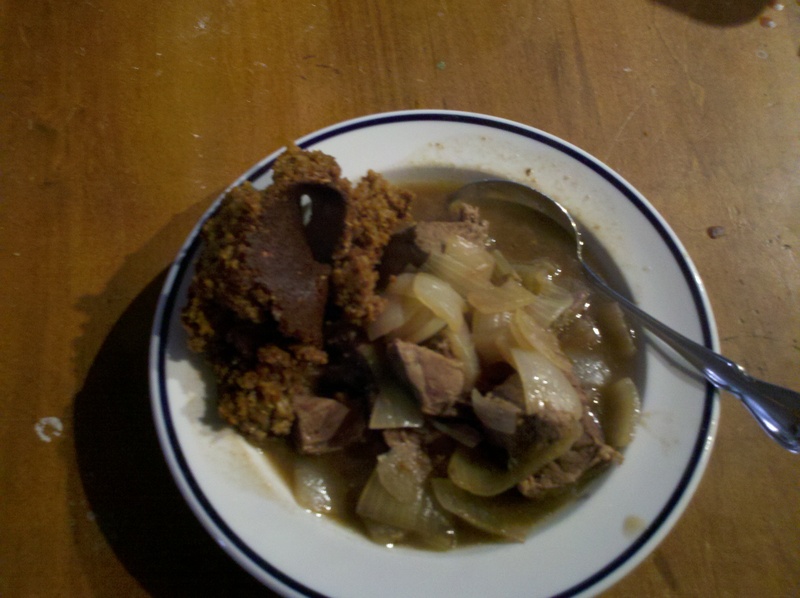 This year, I ditched the corned beef and cabbage for a nice, warm Irish Beef & Onion Stew with a brown Guinness Quick Bread. Unlike Pi Day, I did not cheat on these recipes–perhaps because it was a Sunday and I had the time. Both recipes were a huge hit with the whole family. This recipe calls for quite a bit of beef, but, under various guises, it fed us for 4 days (2 days as the original stew; 2 days as an ingredient in a Shepherd’s Pie). 1. Place beef cuts into mixing bowl and sprinkle with flour and the ground black pepper. Mix until beef pieces are all coated with the flour. 2. Heat oil in bottom of large dutch oven or stock pot. Add beef. Remove to a mixing bowl when browned. Add onions to stock pot and cook until translucent. Add beef back to stock pot. 3. Add mushrooms, beef stock, and Guinness. Then add sugar and herbs. 4. Simmer, covered, for about 1-1/2 hours, stirring occasionally. I served this the first day in large bowls (the same used for the above pot pie) with a side of the Guinness bread (below). The second day, I served it in small 1-cup bowls with a side of rough mashed potatoes and a salad. Then, with a good deal of the stew “gravy,” a bit of meat and some mashed potatoes, I transformed it into a quick Shepherd’s Pie, adding frozen peas and carrots to bulk up the pie filling. The 8 x 8 square “pie” (maybe I should call it Shepherd’s Cake) fed us for 2 evenings, with a side salad. 1. Preheat oven to 425° F. Spray a 8″ x 8″ pan with Pam. 2. In mixing bowl, mix together oats, flour, sugar, baking soda, baking powder, and salt. In a separate bowl, mix together the butter, vanilla, buttermilk, and Guinness. Combine the wet with dry ingredients until well blended. 3. Pour batter into prepared pan. 4. Bake for 30 min. at 425°, then turn temperature down to 400°. Bake 30 more minutes. Remove from oven and allow to cool for an additional 30 minutes. Yes, this recipe takes along time to bake and cool–but it is well worth it! I love beets: roasted, baked, boiled, pickled. Yum! And I’ve really been experimenting with different types of greens recently. Beet greens are among my favorites. 2 large Vidalia or sweet onions, sliced into large pieces. 1. Preheat oven to 400° F. Spray a med. casserole dish or 9 x 13 pan with Pam. 2. Chop beets off of greens and clean and peel. Cut into 2-inch chunks. 3. Clean greens, dry, and set aside. 4. Toss beats with 2 tbsp of olive oil in a mixing bowl. Spread into baking pan. 5. Mix together 2 tbsp of olive oil with 1 tsp garlic powder, 1 tsp black pepper, and 1 tsp sugar and pour into large plastic freezer bag. Add the roughly sliced onion and shake. 6. 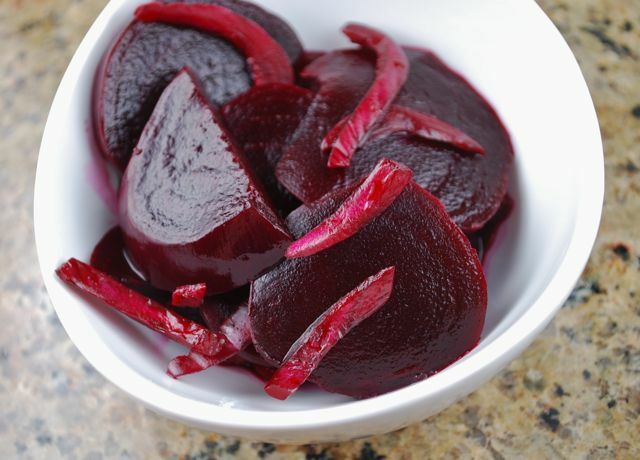 Bake beets for 15 min., then add the onion mixture to the beets and stir to coat and mix. Bake for another 45 min., stirring occasionally. 7. Meanwhile, cut or tear the beet greens into 2- or 3-inch pieces. 8. Heat remaining olive oil in a large skillet over medium heat and stir in the beet greens. Cook until greens wilt. 9. Place greens on platter and top with roasted beets and onions. 10. Taste and adjust for salt and pepper. I made individual chicken pot pies once, from a recipe in Living Simple, I think. It was from a plan-your-week menu deal. I wish I could have kept it up, because it was cool to have a pot pie from the chicken I roasted myself. I think I’d like to have dinner at your house! Anytime you want to drop by! Your pot pies were probably way tastier. Homemade roast chicken is far superior to rotisserie.